What customers consider before employing an electrician? 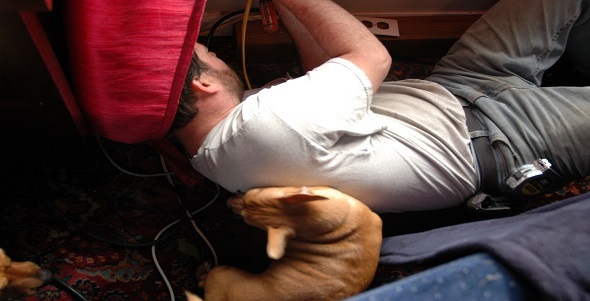 What do customers consider before employing an electrician? There are a lot of factors to consider before employing any worker for any job, however, this blog will cover the information that an average person will consider before hiring an electrician. Following the introduction of Part P of the building regulations on the 1st January 2005 customers have become increasingly aware that electricians should be accredited and competent before they will even consider hiring them. This statement can be supported by a recent ElectricSafe survey which states that 87% of people look for an ID badge linking the electrician to a government approved Part P scheme provider and 90% look for proof of competence. Probably the most powerful form of advertising and proof of competency available to any electrician or indeed any trades person. A recent survey conducted by Checkatrade showed that a massive 67% of property owners would hire on word of mouth alone. If you are a member of a Government approved Part P scheme provider you will appear on either the Electricsafe register or the electrical safety register. By appearing on one of these registers it will without doubt put any potential customers mind at ease that the electrician has passed an independent assessment process to prove they are competent. It is a good idea to keep an up to date business portfolio at all times so that you can show potential customers examples of your work, letters of satisfaction from former clients, Insurance documents and proof of your qualifications to demonstrate that you are both fully qualified and skilled as an electrician. The two organisations that come to mind here who can support and demonstrate your competency by an independent vetting process are Checkatrade and Trustmark. It does not matter if you have all the right credentials if when quoting you are unrealistic on the pricing of the job. Be realistic with your quote even if you have the added advantage of being introduced by word of mouth. Always arrive on time for your quotation appointment or if you are running a little early or late phone ahead to make sure it is still convenient for the customer. First impressions really count so make sure that you are dressed in clean clothes. Remember from the moment you enter the customer’s property you are selling yourself and the service you offer. Whilst all the above points may not be an exhaustive list of what customers are looking for they are most certainly the most important ones. Customers and tradespeople, find out about your trade responsibilities and how to avoid cowboy customers!